The Southwest Boise Neighborhood Bicycle and Pedestrian Plan will be presented to the ACHD Commissioners for possible adoption on Wednesday, October 24, 2018. The meeting will begin at 6 p.m.; however, this project is one of several agenda items and may not be the first item discussed. ACHD staff will make a brief presentation followed by an opportunity for public comment before the Commission acts. Thank you for your interest in the Southwest Boise Bicycle and Pedestrian Plan. The comment period closed on July 10, 2018. Since April the Ada County Highway District (ACHD) has been working on developing a plan to help improve walking and bicycling routes in Southwest Boise. As part of this plan we have been working with residents to identify ideas and concerns related to walking and biking in the community. Based on input from neighborhood residents we have identified projects that may be considered for implementation to improve walking and biking opportunities in the area. 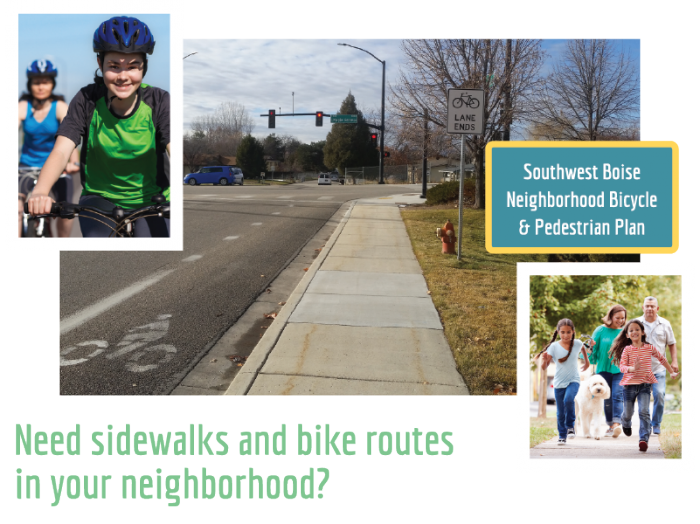 Join us on June 26th to learn more about the sidewalk and bike projects proposed for the Southwest Boise Neighborhood Bicycle and Pedestrian Plan! ACHD is planning for more than just sidewalk and bike projects in Southwest Boise. There are many additional projects planned for the area - View this map to learn more. If you missed the April 3rd open house, below are the materials and handouts from the event. Please note that the comment period ended on April 16th.